There are so many recipes for carrot cake around that I'd say, if you have a favorite one, try it in cupcake cases. This is my favorite - one of those recipes on a scrappy bit of paper tucked into my collection. I like the fact that the frosting contains no sugar, being sweetened with honey. One thing I would suggest - use only proper cream cheese - sometimes sold as curd cheese. I've never had much success with the white soft cheese sold in supermarkets everywhere. It's too runny. © 2019 Kate Shirazi / Pavilion · Reproduced with permission. Preheat the oven to 180'C/350'F/Gas mark 4. Line a 12-hole muffin tin with cupcake cases. Mix the sugar and oil in a large bowl. Add the eggs and mix well. Sift in the dry ingredients, and beat everything together until really well combined. Next add the grated carrots and stir through well. Place spoonfuls of mixture in the prepared cases, and bake in the oven for 15-20 minutes. Watch these like a hawk, as they have a tendency to burn. If the tops are getting a bit dark and it looks like the innards are still raw, cover with greaseproof paper or baking parchment, and cook a little longer. Remove from the oven and allow to cool. While they are cooling, make the frosting. Put the cream cheese in a bowl, and beat until softened. Stir in the honey and orange zest. Give it a taste to make sure it is sweet enough. Add a bit more honey if you want. When the cakes are cold, spread the frosting over the top and decorate at will. 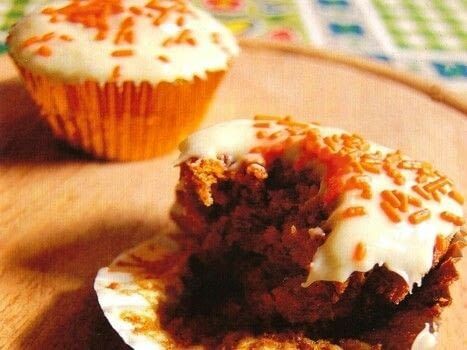 Cool, I adore making carrot cake but I never thought of making mini ones Will have to try this next time we have a party. I like the fact that you use honey to sweeten the frosting and will keep this recipe in mind the next time I make carrot cake.